It’s not a great advert for your sport when your poster boy/flagship rider jumps ship and joins up with the competition, especially when he then goes and gets his (presumably) hemorrhoid-riddled arse handed to him on a plate by old masters like Valentino Rossi and Nicky Hayden. Poor old James Toseland… baptism of fire or what? Our point is, sometimes you may possess all the talent in the world – but that doesn’t necessarily mean you’re going to be able to whip the competition… at least not right off the bat, anyhow. MotoGP’s follow-up 360 installment (‘07) was infinitely better than its initial next-gen stab, and since this is Milestone’s 360 debut, there’s a definite sense of devs struggling to get to grips with the Xbox’s firepower here. Put simply – snazzy rain effects aside – it’s a bit of a ‘LaToya Jackson post- surgery’ in the old looks department. SBK08 is a decent enough biking game though; something of a labour of love (at least under the bonnet), obviously made by biking nuts for biking nuts. Its major draw, along with its serious depth, is the customisation aspect; SBK can literally be as arcadey or sim-like as you want it to be. A caveat though; even in Advanced (the middle ‘realism’ setting) you’ll need to have your racing lines and braking patterns spot-on, otherwise a painful meeting with the asphalt beckons. Despite the ‘two ways to play’ gimmick however, neither were really compelling enough to win us over. Fresh paragraph, fresh gripe, but considering it’s celebrating one of the most high-octane sports in the world, SBK simply doesn’t come packing those life-or-death thrills you might expect to find in a game where you’re hurtling around tracks with 1200cc throbbing between your thighs. Your fear of falling from the saddle stems from the punishingly (albeit super accurate, we imagine) rider/bike inertia, rather than MotoGP 07’s mind-bending sensation of speed. And there’s simply no excuse for that weak framerate, especially when the majority of tracksides evoke the less interesting parts of the desert planet Tatooine. The poor visuals are, ultimately, something no amount of poorly-rendered pit girls can alter. Perhaps though, the crucial difference between MotoGP ‘07 and SBK08 is that the former’s raw speed and power means it can be enjoyed by any racing enthusiast, while the latter is all niche appeal and little else. Not awful, then, just… fair. 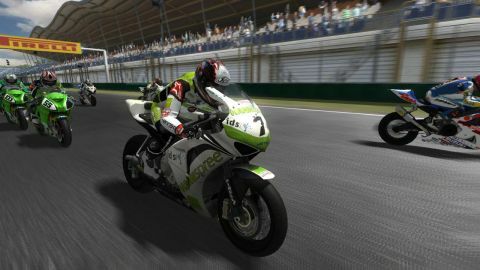 Description A brutally difficult Sportbike racing simulation, SBK 08's ho-hum graphics and stuttering frame rate make it a niche game for motorcycle fans only.